Kids love to eat for the most part, but the problem is that they love to eat chocolate, candy, fries, cookies, cupcakes, chips, and plenty of other not so healthy foods. When it comes to putting the good stuff into their little bodies, they shy away – not perhaps because they don’t like the taste, but because they understand that fruit and vegetables (especially vegetables) are something that their peers don’t like to eat, and they want to be the same as everyone else. That can be a hard thing to combat. However, there are some great, healthy foods that children are more interested in eating than others, especially if you can prepare them in a fun way, so the next time you go grocery shopping, you might want to incorporate some of these items into your cart. You may not realize it, but eggs are actually packed full of good stuff such as protein and Vitamin D which helps the body to absorb calcium. In fact, eggs are one of the very few foods that have naturally occurring vitamin D in them, which is just one of the reasons why they should be included in your child’s diet where possible. Breakfast is the perfect time to eat an egg, because the protein they contain will help keep your child feeling fuller for longer, so there is less chance of wanting or needing a mid-morning snack. Oatmeal is another ideal breakfast item, but if you want to prepare it at other times of the day, then that’s not a problem. The reason it works for breakfast, however, is that it is great for helping kids concentrate at school, pre-school, or even at home with you or a childminder. That’s because oatmeal is full of fiber-rich whole grains and these are digested slowly; that’s good because it provides the child with a steady stream of energy, keeping them active and more engaged for longer before they need a top up. If oatmeal alone doesn’t appeal, try adding chopped fruit, or anything your child will eat, to it for extra taste. Don’t throw a ton of sugar into it or you’ll undo the good effects. If it does need to be sweetened, try something else such as honey or agave syrup. Although it may not be high on your child’s list of favorite foods, fruit is something that all children should eat plenty of. Fruit, in general, provides all of the essential vitamins and minerals that your child needs to grow and thrive healthily, and it can be added to plenty of other dishes to bulk them out and make them tastier. We’ve already mentioned oatmeal above, but other ideas include making breakfast or snack time smoothies and frozen yogurt. As well as all the vitamins and minerals that your child will gain from fruit, including fruit in their diet will also ensure that they have a balanced diet in terms of digesting their food as well. It will ensure they have enough fiber in their system as well, which can help prevent issues with digestion. It’s best to eat a range of different fruits so that your child tries new tastes, but even if they do end up just sticking to one type, it’s far, far better than nothing. Fruit, in general, is good, but blueberries are especially wonderful fruit to give your kid if you want them to have a healthy diet. Blueberries are full of antioxidants, and they are said to be one of the healthiest fruits you can possibly eat. They protect against diabetes and heart disease, as it’s never too early to start protecting your body. Nuts are incredibly good for kids and adults in moderation because they include healthy fats which are great for keeping the heart well maintained plus they offer a good burst of energy throughout the day. Nuts can be sprinkled on breakfast cereal, for example, or eaten as a snack. Of course, there are risks associated with nuts, so it pays to be careful. Nut allergies are dangerous and if you don’t know whether your child can tolerate nuts, make sure you start them with just a small amount to see if they have any kind of reaction. Be careful also about sending your child to school with nuts as a snack – just because your own child doesn’t have an allergy, that doesn’t mean no one else does. Some schools have a rule that no nuts are allowed, and this seems to be the safest option. It is better to be safe than sorry and is always worth checking, especially if a friend comes around for dinner one evening. It is best to check for any allergies beforehand. Milk can be used in a variety of different ways and is great for creating fuel for the brain and body – milk contains calcium which makes strong bones and. Milk is ideal as a standalone drink, but of course can be added to cereal, porridge, smoothies, and much more, so that it can be incorporated into a child’s diet easily. It’s easy to give to children as well, too as they will have grown up on milk of some form, so adding a different kind won’t cause too much fuss. 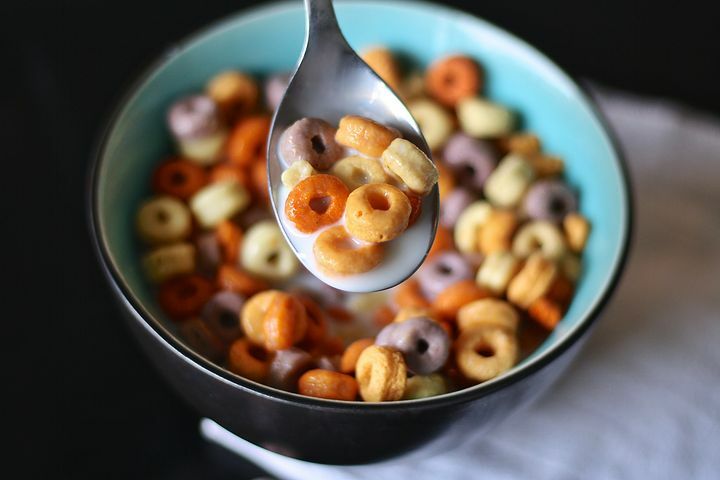 Milk can be incorporated into a child’s diet through breakfast cereal as well as through the occasional glass. Apart from milk, water has to be the very best drink a child can have. There are no added chemicals or sugars, it’s completely natural, and it’s the best way to keep the body functioning properly. Plus, if your child is saying they are hungry but it’s far too early for a snack or the next meal, a cup of water should help those hunger pangs go away. The body needs water to survive, so ensuring that your child gets enough is essential. Most water from the kitchen faucet is absolutely fine, but sometimes it can have a foul odor or taste, depending on where you live. To ensure you get pure, filtered water from the faucet you might want to invest in a filter from AquaPure Solutions. This will take out any of the nasty smells and tastes and will also ensure that the water you and your children are drinking is totally delicious and pure. Tofu might not be the first thing you think of when it comes to finding new, healthy things for your child to eat, but perhaps it should be – it’s an excellent source of protein and even has some anti-cancer benefits say the experts. Tofu is super versatile and can be added to most meals such as casseroles, soups, stir-fries or as a meat substitute in general. The liquid variety can be used in smoothies instead of yogurt. Whether you consider tomatoes to be a fruit, which they technically are, or a vegetable, which makes more sense when you think about how you will incorporate them into meals, tomatoes are a great item to give to kids. They can be paired with plenty of other healthy ingredients. Tomatoes can be used in salads, eaten with olive oil, used as an ingredient in a homemade pasta sauce, and much more to create a tasty, nutritious dish that will boost your child’s health and fitness levels and keep their bodies working properly. Low-fat Greek yogurt contains copious amounts of good bacteria. This good bacteria boosts the immune system and helps with digestion, making the body more efficient and ridding it of toxins more quickly. Greek yogurt (particularly the low-fat version) has triple the amount of protein but far less sugar than regular yogurt, so it’s the best option. Some kids might not like the tartness of it, but that can be fixed by adding fruit or honey. It is important to remember to only give them fruit or honey after they are one year old. Some children may not particularly like vegetables very much. As mentioned earlier, this could be down to trying to be like their friends, but it could also be to do with taste. A child’s taste buds are much more sensitive than an adults’, so anything bitter or even slightly unpleasant will taste much worse. This can be the case with some vegetables, and that can have a lasting effect. Cabbage, however, has a much milder flavor that kids don’t seem to mind, plus it is a crunchy food, and textures are always something that children find interesting. Yet cabbage is more than just a nice taste and a fun sound; it is a cruciferous vegetable, and that means it contains phytonutrients which improve digestion and lower the risks of some types of cancer. Cabbage also rids the body of toxins by ensuring the release of enzymes through the body. Overall there is plenty of food out there that can be beneficial to your child. Introducing children to a range of healthy foods early on can ensure that they are used to the foods in their diet and grow to like them after time. Of course, it is important to have a balance, but by striving to ensure there are enough healthy foods in your child’s diet, you can rest assured you are contributing to a healthy lifestyle for our child for years to come. ← Why is the Rate of Pediatric Cancer on the Rise in the United States?